Ya know, there are those days in August where temps and humidity rise to uncomfortable levels and we start howling about the Dog Days of Summer and start wishing for winter. Not sure why we blame our canine friends for that but they take the blame. Probably a cat conspiracy! Well, check the weather for today…February…Winter….its going to be 67 degrees! That is a relative heat wave for this time of year. Makes these the Dog Days of winter! But complain as we might during the Summer for the frozen days of February I don’t think we’ll hear any bitchin’ about this little mid-winter thaw. Enjoy it while it lasts cuz ol’ man Winter ain’t done with us yet! 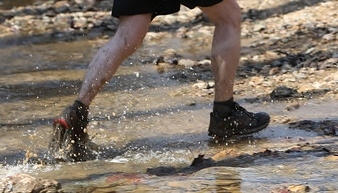 Tonight frozen trails will magically turn to mud as we slap our happy feet on the single-track trails of Redland. OUTTA THE WAY CAFE NIGHT!!!!! Bring your appetite cuz we’ll saunter over to visit Catherine( our waitress) and the crew at our favorite local pub for a burger and brew!!! OK, Trail Dogs, see you out there for the Dog Days of February!